The new T110 is the smallest model in the compact tracked loaders portfolio. This small frame machine combines all the advantages of a compact loader with many new improvements to meet your requirements. With small dimensions and light operating weight for easy transport from one job site to another, the compact T110 offers optimal flexibility and productivity. High performance is ensured by unbeatable power to weight ratio (42 HP/31,2 kW) with the 4 cylinder V2403-M-DI-E3 KUBOTA natural aspirated engine; new hydraulic pumps and a dedicated pump for the charge system. Fast cycle times result in increased productivity and profitability. Spacious cab with excellent visibility, custom-developed headlights, easy-to-remove top and rear windows, a rigid domed roof, shock-absorbing mount cushions and a flex tube for the exhaust as well as enhanced seat bar configuration for improved access contribute to first class operator comfort. The bystander noise level is significantly reduced to 101 dB while the EU Directive 2000/14/EC only requires 103 dB. The T110 is equipped with a new instrument panel providing additional functions and state-of-the-art easily accessible diagnostic capabilities. The transversely mounted engine and the swing-open tailgate offer optimum ease of maintenance. Access to standard service points has never been easier. Strong frame construction offers increased strength and durability. 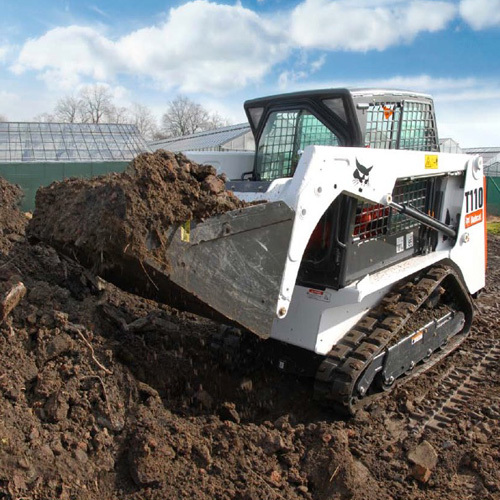 Thanks to a wide range of attachments and 52 l/min hydraulic flow, the T110 can handle a variety of construction, landscaping, agriculture, horticulture, rental, mining, demolition and military jobs and many more applications with ease. Get even more with the Deluxe heated cab, the Power Bob-Tach™, the Deluxe instrument panel, the menu driven display, online help and the Master Password available as factory options. 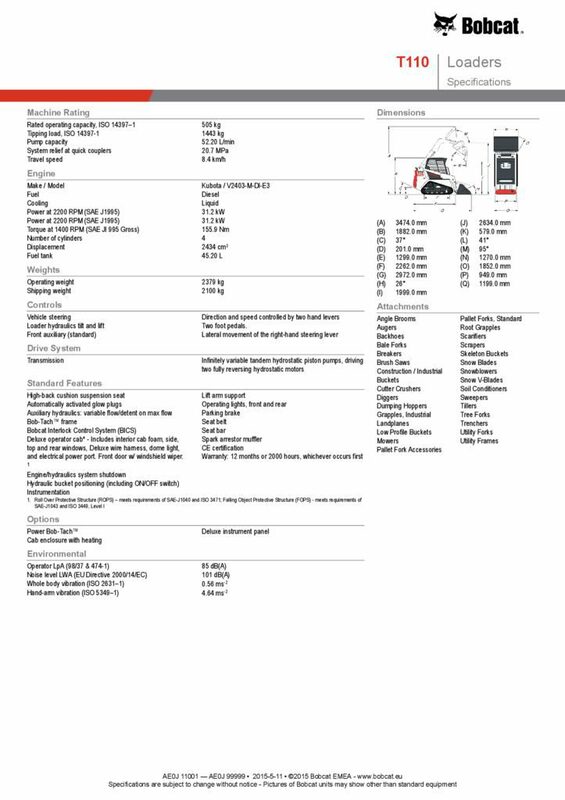 Looking for more information about the T110? Get in touch with your local Bobcat dealer. Quickly find the closest Bobcat dealer thanks to our dealer locator. The T110 is 1199 mm wide, 1882 mm high and 2972 mm long with a 50” C/I bucket attached. An operating weight of 2379 kg allows easy transport on a trailer behind a medium sized car. A dedicated pump for the charge system. A domed roof, curved from front to back and side to side helps shed water. The roof also has formed ribs that increase its rigidity and dampen sound. The T110 is equipped with a new instrument panel providing additional functions and diagnostic capabilities. State-of-the-art easily accessible diagnostic capabilities: Press and hold the “i” button (no. 18) for 2 seconds to consult the service codes. The service codes will show up as Mxxxx, with M being the controller the error is coming from and xxxx being the actual service code. There is a list of service codes in the System Setup & Analysis section of the T110 Operation & Maintenance Manual. Besides M, we also use letters A, D, H, L and W.
All standard service points such as filters and air bleeding system are easily accessible thanks to the large tail gate and the transversely mounted engine. The shape of the Bob-Tach mounting system has changed from a flat design to a more open design, giving the operator better visibility to the attachment. The central tilt cylinder has been replaced by two cylinders, one at each side. This improves visibility, facilitates entering and exiting the cab. Similar attachments index like S100.